March 25, 2014 — I was digging through the detritus of my past the other day (I have to do that every once in a while to clear a path to the bathroom), when I came across two artifacts from a half-hour moment in time that I’d all but forgotten about and which pretty much represent a proto-OTIS jaunt of mine (and perhaps the very first): an old newspaper clipping and what looked like a post card. It was early 1997, the beginning of my weird, weird, Florida years. 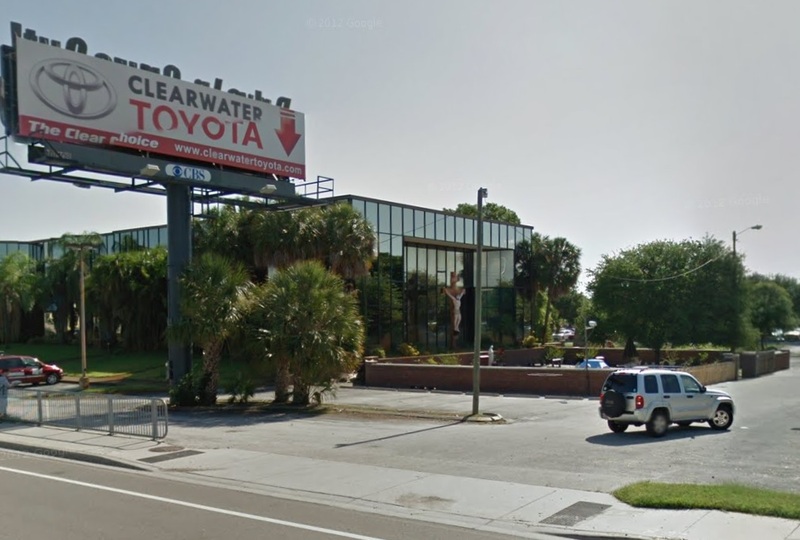 I was in Clearwater, on the Gulf side of the peninsula, right next to Tampa. I was talking to a friend who casually informed me that a miracle was transpiring nearby. We jumped in the car to go see it. Now, that’s a simple statement, but it took me a long time to connect hearing about weird stuff and going to see it firsthand. Living in Florida was like being in an oven made completely out of white ceramic. And that’s how I remember this little trek, hot and glaring. 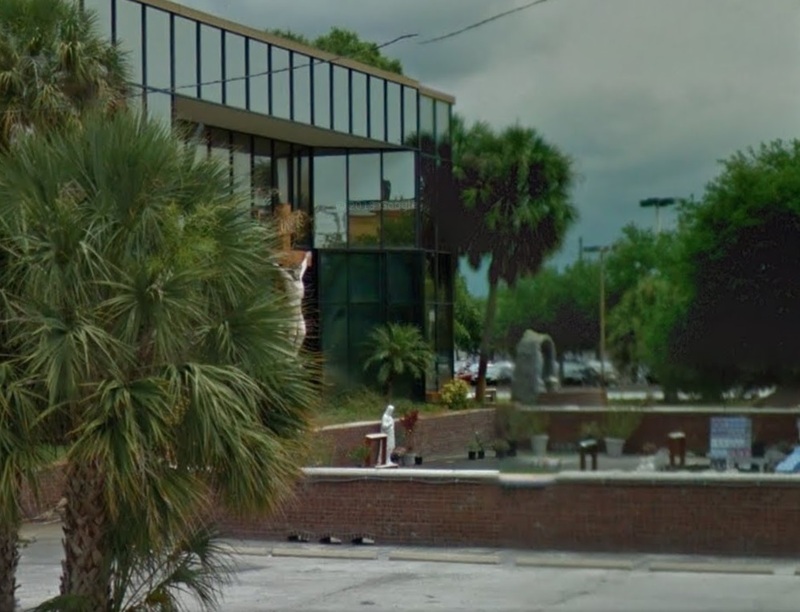 We pulled into a parking lot off US 19N to find it filled with people and white plastic deck chairs, all of which were pointed at the side of a finance building. 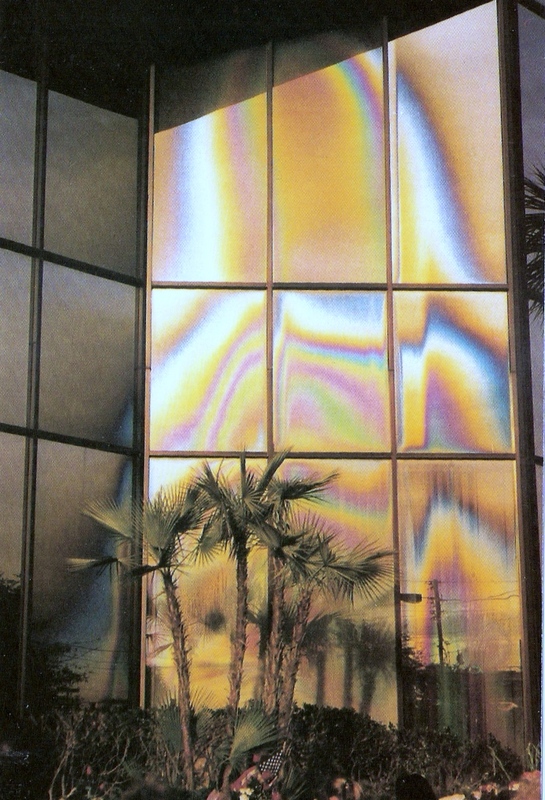 The building was about two stories tall, all mirror-finished glass, with palm trees here and there around its base. The wall that the chairs and bystanders faced was inset with a large niche that took up almost the entire side of the building. And on the side of that niche glowed an apparition of the Virgin Mary. Now, this wasn’t some gnarled tree bark or a burnt Tostito. 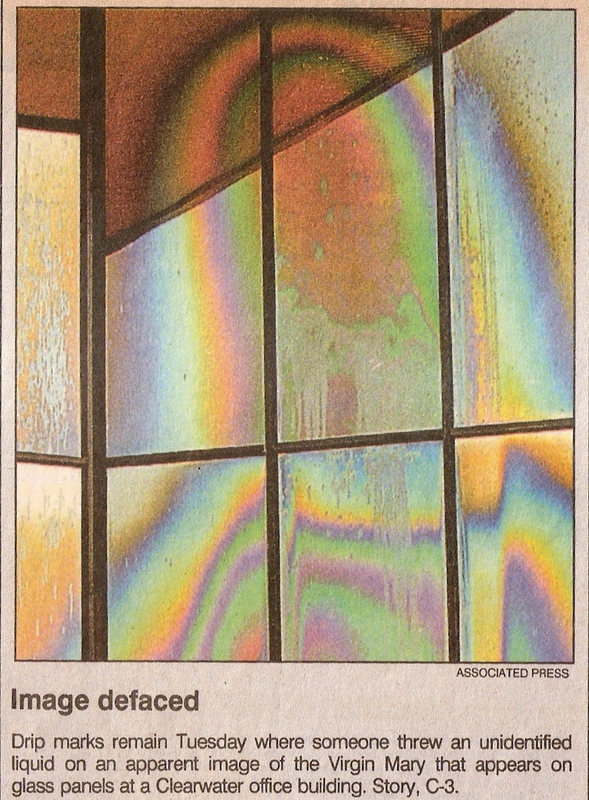 It was a 60-foot-tall prismatic rainbow in the shape of a gently cowled and faceless figure. If you’re going to CGI a vision of the Virgin Mary into your Biblical epic, you might come up with something like this. Even if you’re not one to believe that the miracles of God have devolved over time from creation of a universe to parlor tricks with water and wine at weddings to a chemical reaction on a window, it was still an aesthetically interesting sight, made only less so by the fact that other rainbow stains of various sizes and shapes could be found on other sides of the building. In had appeared just a couple of months previously, in December of 1996. Somebody randomly noticed it on their way into work…and then everybody noticed it. Hundreds of thousands of people visited it over the next few months and, over the years, people started citing visitor numbers in the millions. 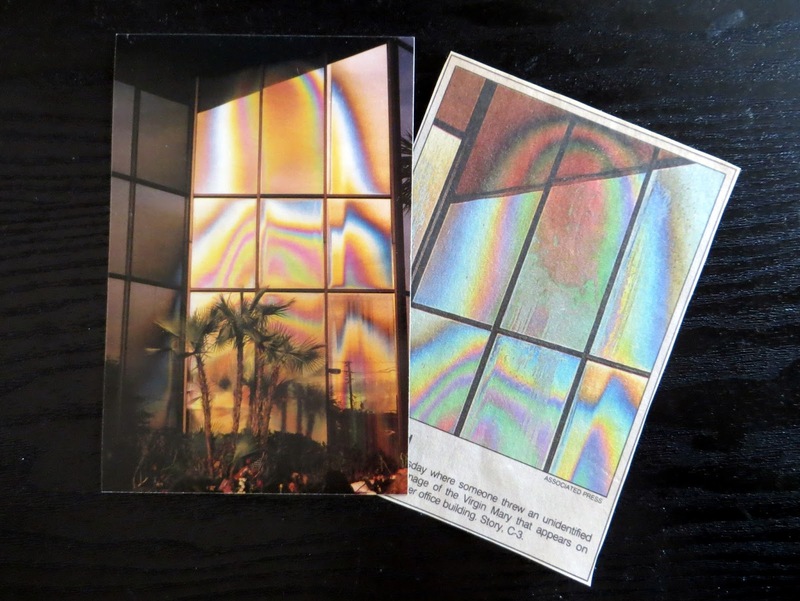 It got enough attention that in 1997 a then Ohio-based Catholic group called Shepherds of Christ Ministries bought the building and erected a permanent shrine there in that lot beneath the blind, multi-colored gaze of that pretty piece of glass. On my visit to the site, there were a few dozen people milling around. Some showed awe, others curiosity, others obvious skepticism. I don’t remember my attitude, but I can safely assume based on general knowledge of myself at that time that is was somewhere just north of jerk and west of hypocrite. We wandered around until we were approached by a little old woman who handed us an audio cassette and the postcard that, 17 years later, I still have and will probably now use as a bookmark for my Kindle. The postcard shows an image of the apparition, on the back of which is what purports to be a series of messages from the Clearwater Madonna, as “received by Rita Ring and reviewed for moral and theological errors by Fr. 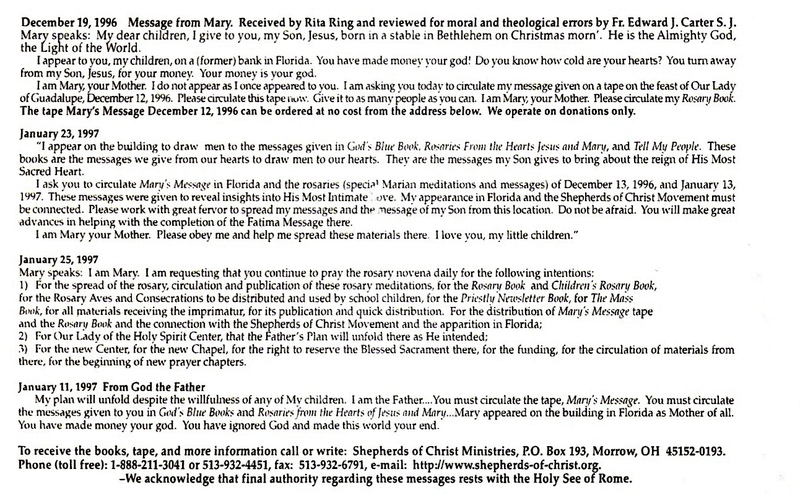 Edward J. Carter S. J.” A quick Google search reveals that Rita Ring is somewhat famous/infamous for being God’s Postmaster General for humanity. I don’t think I ever read the card until now. Mostly, it’s platitudes about the evils of loving money (that’s why she appeared on a financial building), the inevitability of God’s plan, and the importance of getting the message of this 2D Technicolor Madonna (and the books of Rita Ring) out to the world. I’ve scanned it in case you want to go deeper with it. On the way home, we popped the cassette into the tape deck of the car, which at this point in the history of audio technology was only used to hold one of those cassette-shaped adaptors that allowed you to play a portable CD player through the car speakers. The voice was soft, female, strangely modulated and, now that I’ve read the back of the card, basically reiterated what is there. As to the newspaper clipping, I’m not sure what paper it’s from. Apparently when I did newspaper clippings, I cut out the picture and ignored the article itself. I was practicing for the Internet, I guess. On the back of the clipping is a partial advertisement for Sprint involving an illustration of a pterodactyl carrying a stone table that says “Circa 200,000 B.C. Carrier Pterodactyls. Message recipients often became snacks.” The small print at the bottom says that the advertised offer is good until 6/15/97. The image shows the Clearwater Madonna with what the caption calls an “unidentified liquid” running down her face, thrown there by vandals. Apparently, my interest in the Madonna stopped after that clipping, so I looked up the old girl just now to see if she was still around. Turns out she’s been beheaded. The apparition surprisingly survived until 2004, when some 18-year-old kid shot out the top three glass panels that made up her head with a slingshot. I didn’t document my time there. Don’t even think I owned a camera back then. 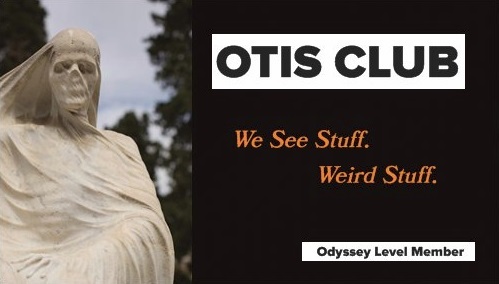 Like I said, proto-OTIS. Looking back, though, I did something different that day. Different from my usual routine, away from my usual haunts, something I could talk about 17 years after the experience. Thanks, mother of Jesus. You almost showed me the way.